Last week one of our customers mentioned that he thought the shipping charges to Port Klang were too high. First off, I’ll say that we charge you what the shipping company charges us. We don’t add anything so that we can keep the costs down. At the bottom of the article I’ll give you a bit of advice on how to keep costs low. But how much? How much cheaper is it to send to Singapore than Port Klang or Jakarta? What is the tradeoff off using a conventional vessel compared to a container? 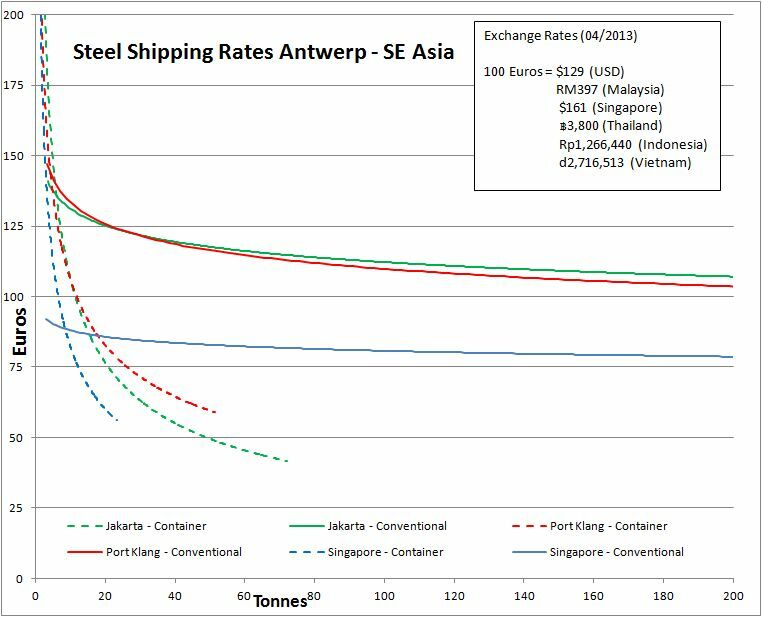 So I got some data from customer orders over the last few months and put a little graph together that compares shipping rates to Singapore, Jakarta and Port Klang from Antwerp. We use Antwerp because it is the closest port to our warehouse – but also because more steel is shipped out of Antwerp than any other European port so prices are cheaper and forwarders more experienced. For the technically minded, the lines are a trendline off the date using a Power trendline as that seemed to fit the data best. Small orders are cheaper to ship by conventional if you can wait the extra time. Small quantities are made expensive to ship by container because of the higher fixed costs of documentation and stuffing. 200MT is the limit as that is what we do from stock. Container prices go up to about 60-70 MT because after that, most plates required are larger sizes. Singapore is a lot cheaper due to volume and number of vessels going there. Laem Chabang and Ho Chi Minh and Surabaya are similar to Port Klang and Jakarta. These prices are indicative only but should be suitable for budgeting (though shipping prices do change over time). For small orders consider using conventional vessels if time is less of a concern.